We don't need to have money to give. This week shows us the importance of showing up in small ways for the ones we love. It's easy to think that grand gestures or big gifts means the most. After all, they're certainly the most noticeable. But what is happiness truly made of? And, yes, that is a big question to start off our Monday! But this week is one of gentleness, slowness, and the power of showing up. We begin with the Ten of Cups, a card that's so straightforward with its message it's almost frustrating. We can look at it and think "emotional abundance, hooray!" and then move on to more dramatic pastures. Unlike the Ten of Wands or the Ten of Swords, suits that get overbearing when taken to excess, the Ten of Cups is, quite plainly, delightful. In the Rider-Waite-Smith deck this card depicts a family of four cavorting under a rainbow lined with ten cups. Not only are their cups running over, they're levitating in a rainbow! But this card begs the question - how did we get here? It's not through the power of conquest or accumulation, but rather the quieter, long-term journey of building relationships. This week we're being asked to think about all the little things that have added up to create this rainbow array. How have we built joy, support, and healing in our ties with others? And, most importantly, how can we celebrate it more? The Page and Six of Pentacles shows us that we're in a giving mood. We want to make a difference, to reach out and be there for people, but we're trying to approach it in the realm of pentacles: material gestures that we can see and touch. There may be a tinge of wistfulness here - why can't we be the King of Pentacles, providing everyone with everything (and having plenty left over, to boot)? 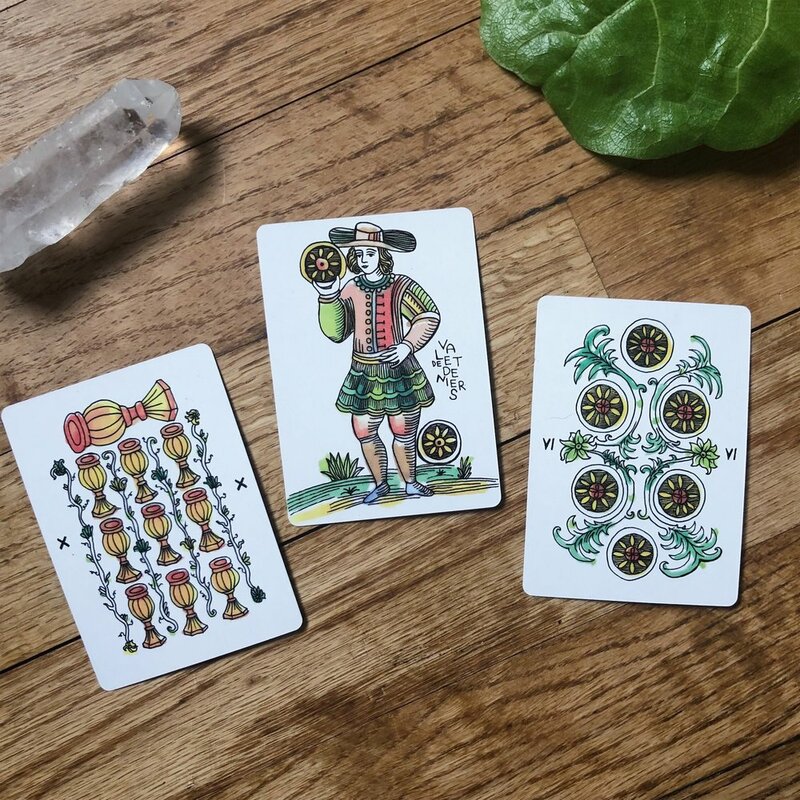 The Pages, while also being exciting harbingers of new directions, also tell us to take baby steps, and I'm fascinated by how this page is turning his back on the Six of Pentacles - a card about material giving - and focusing on the Ten of Cups instead. So let's follow suit and redirect our attention to the rainbow here. Truly, something miraculous is happening, and this card is inviting us to look closer at what may be so interwoven into our daily lives we hardly notice it. What specific joys do we contribute to our relationships? What connections have we worked hard to build? And which are so natural they seem spontaneous? This week is all about detaching from the desire to show our support materially and financially and recognizing the way we add "value" simply be being there for the ones we love. Presence is so much more than presents, in other words! And it's a completely renewable resource. So as you might guess, this reading is gently nudging us to spend quality time under our respective rainbows and to re-frame our current situation as one of an abundance of affection. Reach out to an old friend, host a cozy dinner party, and listen to the ones you love. It means so much more than any gift you can buy.